So Richard and I are back from San Francisco, and delighted to be experiencing the best of the British summer! One more photo from the US though – again from the offices of our PR company (The lovely Edelman). 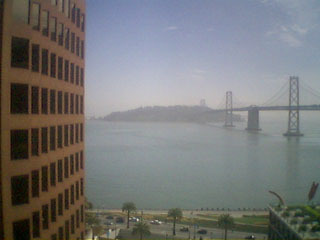 Looking out over the bay, on a stunning day, I couldn’t help but notice the office next door. The one where all the windows face away from bay and that amazing view. How gutted must you be to work in that office, and know that just…over…there… is some incredible scenery, but you can’t see it. Personally, I blame incompetence, but it’s a pretty major flaw. Having spent over a year helping ‘design’ the Zopa screens and interface, I am more than happy to accept that good design is a true skill, and that it is very easy to come up with something that makes perfect sense – until you actually build it. What bits of Zopa make you go "Doh"?